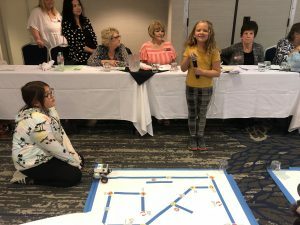 Seven of the girls participating in the Robotics program from the Boys & Girls Club, attended the Zonta meeting on April 10. Each girl introduced themself and talked about robotics and their robot. 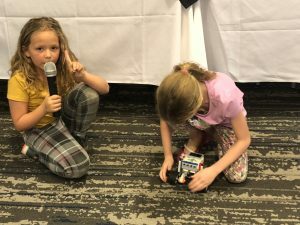 Then they took the mic away from Robotics chair, Darleen Lyons, and lead the rest of the presentation. These girls are not shy, except fo one. They demonstrated different lessons programmed during the year. 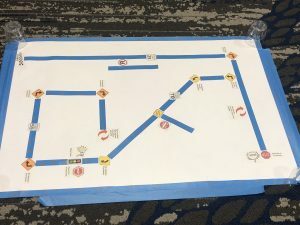 First up, Jaelyn, showed us a road map where she had to make many different types of turns, spins, a stop sign or two and sounds. Next up was a demo on the color sensor. Mia programmed her robot to stay inside the black line by using reflective light. 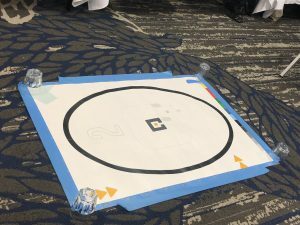 Then she showed the Zonta members how her robot will follow a black line. Next was Shelbie and Ryder to demonstrate how to program. This turned into all the girls getting together to tell each other how to do it. The end result was a robot that went forward, turned around, backed up and turned again. All of the girls had a great time. At the end of the program, the shy girl, Genesis, took the mic to say that she used to be shy, but not any more. Broke all of our hearts. With a final thank you to all the Zontians for their support, back to the Boys & Girls Club. Pinewood Derby is always a favorite at the Boys & Girls Club in Newhall. 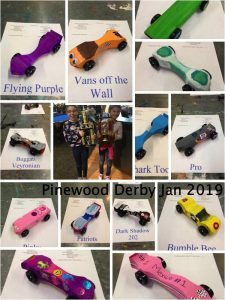 Recently 13 girls and boys designed, painted and raced their cars. The picture shows the designs. 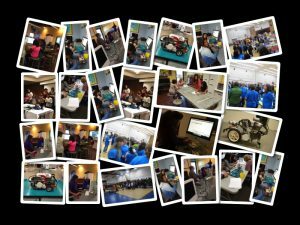 We had several of our robotics girls build their cars. There were two age groups and four of the six winners were girls. The two shown here were first place winners in their age group. Way to go! 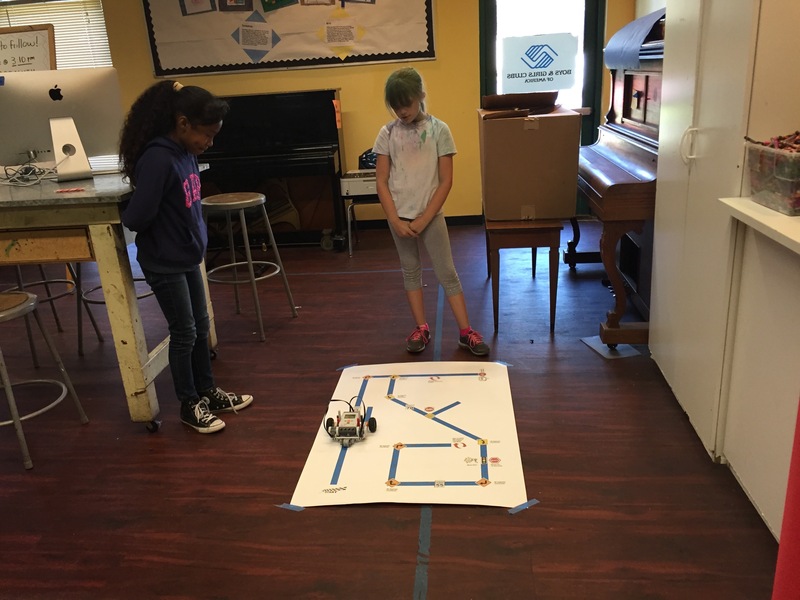 The Zonta Club of Santa Clarita Valley was recently awarded a grant from Boston Scientific Foundation for the Girls' Robotics Program. We are very excited and humbled with this grant award. With the award we will be able to replace several of the robot bricks (brains), new batteries and assorted new sensors and motors. These pieces are over 10 years old and are having difficulties working with the new Lego Mindstorm software. With these additional new bricks we will be able to expand the program to more girls. Thank you to Boston Scientific for this grant and believing in this program. 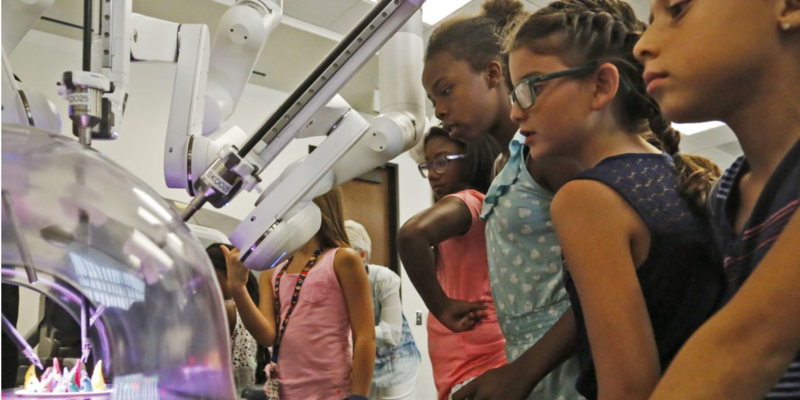 The Zonta Club has joined forces with the Boys and Girls Club and offers a Robotics Program for girls, ages 9 – 14. This program is designed to foster interest and skills in the Science, Technology, Engineering and Math (STEM) fields. 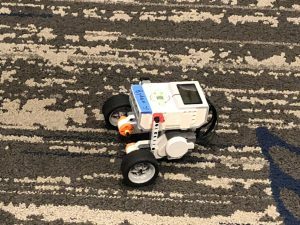 Participants learn to design, program and control fully-functional Lego Mindstorm Robots. The girls use software to plan, test and modify sequences of instructions for a variety of life-like robotic behaviors. They learn to collect and analyze data from sensors, using data logging functionalities embedded in the software. Individual lesson plans cover the basics to more advanced so that girls can join the program during the school year and advance at their own pace.